I should be clear at the outset about what I’ll mean — and won’t mean — by “universalism.” As I’ll use it, “universalism” refers to the position that eventually all human beings will be saved and will enjoy everlasting life with Christ. This is compatible with the view that God will punish many people after death, and many universalists accept that there will be divine retribution, although some may not. What universalism does commit one to is that such punishment won’t last forever. Universalism is also incompatible with various views according to which some will be annihilated (after or without first receiving punishment). These views can agree with universalism in that, according to them, punishment isn’t everlasting, but they diverge from universalism in that they believe some will be denied everlasting life. Some universalists intend their position to apply animals, and some to fallen angels or even to Satan himself, but in my hands, it will be intended to apply only to human beings. In short, then, it’s the position that every human being will, eventually at least, make it to the party. Contrary to what many would suppose, universalism, understood as above, receives strong scriptural support in the New Testament. Indeed, I judge the support strong enough that if I had to choose between universalism and anti-universalism as the “position of Scripture,” I’d pick universalism as the fairly clear winner. But more on that later. For now, here’s three passages which support universalism. Note the “all.” I guess there can be some question about what it means to be made alive in Christ. A cynic might suggest that some might be made alive in order to stand judgment and be tortured forever. But that’s very strained, especially after one’s read the surrounding context of this passage and has also discovered what’s usually meant by such phrases. It’s very clear, I think, that those who are “made alive” in Christ are, as it’s often put, “saved.” The question is, To whom will this happen? This passage’s answer: All! A point of grammar, which holds for the Greek as well as our English translations: The grammatical function of “in Christ” here is not to modify or limit the “all.” The passage doesn’t say, “…so also shall all who are in Christ be made alive.” If it said that, I wouldn’t be so cheered by the passage. Rather, “in Christ” is an adverbial phrase that modifies the verb “shall be made” or perhaps the whole clause, “shall all be made alive.” Thus, this passage says that all shall be made alive. How? In Christ. This last point — that it’s through Christ that all will be saved — will be important in section 6, below. Note again the “all.” Show me someone burning in hell, and I’ll show you someone who’s not yet been reconciled to God. So, show me someone who’s under divine punishment forever, or who is simply annihilated, and I’ll show you someone who’s never reconciled to God through Christ, and thus someone who gives the lie to this passage. It’s verse 18 that I’m mainly appealing to. For whom will Christ’s act of righteousness lead to acquittal and life? Answer: “all men.” (So at least we guys will be OK!) Show me someone who never enjoys acquittal and life, and I’ll show someone for whom Christ’s act of righteousness didn’t lead to acquittal and life, and thus someone who gives the lie to this verse. For various reasons I won’t go into here, though I think this is a good universalist passage, I don’t think this passage is quite as strong as some of the passages we looked at in section 2. I bring it up because it’s in response to this verse that I’ve found a commentator making a move I’ve heard many times in conversation. About this verse, the end of which he renders, “that he may have mercy upon all”, F.F. Bruce writes: “That is, on all without distinction rather than all without exception” (The Letter of Paul to the Romans: An Introduction and Commentary, Leicester, England: Inter-Varsity Press, 1985; p. 211). Several people I’ve spoken with about our universalist passages had apparently been taught that “all” can mean “all without distinction” rather than “all without exception”. What exactly is “all” supposed to mean when it carries the former (“without distinction”) sense? Some seem to hold that it then means “some from each group”, and where it’s people that are involved, each group seems to mean each nation. For others, it means something a bit more: That every person, regardless of which group she’s in, has a chance. What’s going on here is that the quantifier phrases of natural language (“all”, “most”, “some”, etc.) are to be understood, on an occasion of use, relative to a contextually determined domain. Thus, when I say, “All the beer is warm”, the contextually determined domain is the things in this room, so “All the beer”, in context, means all the beer in this room. So there is some sense in which “all” doesn’t always mean all: On some occasions of use, “all”, or “all the F’s” means all (or all the F’s) within a limited domain. But, relative to that domain, “all” really does mean all (without exception): My sentence “All the beer is warm” turns out to be false if there is some cold beer that I failed to notice in the room. But when the domain is limited, there has to be some fairly clear clue as to what the limited domain is. When “all” is used in the New Testament, as in “For all have sinned and fallen short of the glory of God,” and similar passages, the “all”, I take it, refers to all people. It could possibly refer to some restricted class of people, but that suggestion is to be rejected, b/c (a) there is no such restricted class that clearly presents itself (all the people in this room? ), (b) it’s incumbent on a speaker to make clear what the class is if he means for it to be specially restricted and no specially restricted class clearly presents itself given current conversational intents and purposes, and (c) the NT doesn’t specify any such specially restricted class. So, “All have sinned” means that all people have sinned, as almost all would agree. But similarly for the “all”s of the universalist passages. No restricted class of people clearly presents itself, and the Biblical writers aren’t so incompetent as to mean some specially restricted class of people that doesn’t clearly present itself without specifying or somehow making it clear which class they mean. Indeed, in I Corinthians 15:22 and Romans 5:18, each of the relevant “all”s occur in the very same sentence (and a fairly short sentence, to boot) as an occurrence of “all” that seems to refer to the whole human race (given that it’s the whole human race that died/was condemned in Adam), so it would have been especially misleading or even incompetent for Paul to mean something less than the whole human race there, since that would involve switching the domains relative to which his claims should be interpreted without warning in the middle of a single sentence — and a sentence that seems to be stressing the parallelism between its two clauses, for that matter. So I see no reasonable alternative but to conclude that these “all”s refer to all people. The only universalist passages that we’ve looked at in section 2 which seems to carry any suggestion of a broader scope is Colossians 1:20, the “reconciling all things” passage. (There are other passages in the Bible carrying similar suggestions — see, for instance, Ephesians 1:10.) How to square that with Rev 20:10, I don’t know, though I am in general far more cautious about my understanding of Revelation than of any other book in the Bible. In general, I find it unwise to take much of Revelation literally, and so, in questions of what will actually happen, tend to take fairly minimalist interpretations of the events John relates from his vision — or at least not to be confident of anything beyond a minimalist reading. So, for instance, though John reports in 6:13 that “the stars in the sky fell to earth, as late figs drop from a fig tree,” I’d be disinclined to think that stars will literally fall to earth. That this is not to be taken literally is now confirmed by our current knowledge of the relative size of the earth and the stars (together with the fact that, in John’s story, this event does not completely obliterate the earth; the story goes on), but even without such knowledge, based merely on the genre of that part of Revelation — John’s reporting a vision he was given — I would be disinclined to take such a passage as a literally correct description of what will actually happen in the future. How exactly to interpret such a passage as to what will really happen is a controversial matter. But I tend toward this minimalist reading: All that’s meant about what will really happen — or, at the very least, all that we can be reasonably certain is meant — by this report of stars falling to earth is that very, very bad things will happen. Given the abundance of events reported in John’s vision that must, I think, be read in such a minimalist way, I’m very cautious about taking very literally the report of Satan’s doom in Revelation 20:7-10. Shall we now suddenly start taking these events as literal reports of what will actually happen? The minimalist reading here is that evil and deception will be decisively defeated. And, though I don’t want to dogmatically declare that no more than this is meant to be a prediction of what will actually happen, I certainly don’t see any grounds for being at all confident of anything beyond such a minimalist reading. So, I don’t think a strong reading of the “reconciling all things” in Colossians 1:20 must in any obvious or automatic way be shot out of the water by what’s to be found in Revelation. In fact, given the nature of the two books, if anything, it’s our understanding of Revelation that should be guided by the teachings of the likes of Colossians, rather than the other way around. Our understanding of the straight teaching of doctrine in an epistle certainly should not automatically give way to an interpretation of what in John’s report of his vision is to be taken as a literally accurate description of what will actually happen. On top of all that, even if you do take Revelation 20:10 to be a literal description of what will actually happen, the phrase that gets translated here in popular English translations as “for ever and ever”, needn’t be translated as implying endless duration; in fact, if you insist on literalness, more literal translations render this phrase “unto the ages of the ages” or “for the eons of the eons.” Literally, while this perhaps can, it certainly needn’t, mean forever, though it does seem to indicate at least a very long time. Thus, though I don’t find nearly as much scriptural support for a more thorough-going universalism that includes even Satan (Origen, one of the early universalists, held to such a more thorough-going universalism) as I do for the more modest form of universalism I’m here defending, and though I don’t find enough support to advocate such a more thorough-going position here, at the same time, I certainly do think the more robust universalism is worthy of serious consideration. I believe the above pro-universalist passages, and, as you’ve seen, take them quite literally. (I should note here that there are several other universalist passages I didn’t utilize above. The above, though, I think, give you a good idea of the type of passages that can be marshaled in favor of universalism.) I wouldn’t say that they constitute an overwhelmingly strong case for universalism (see sections 5-6 below, for a view — exclusivism — the support for which I am willing to call overwhelming), but it is pretty strong, and stronger than any case I’ve seen for anti-universalism. Still, if there are passages which teach that universalism is false with anything close to the force that the above passages carry in favor of universalism, we’re going to have to consider re-adjusting our understanding of the above passages. Maybe they really don’t mean what they seem to. And, indeed, most who write against universalism, when they urge an understanding of the above passages which strips them of their universalist implications, do so largely on the grounds that other passages of the New Testament teach even more clearly that universalism is false. Indeed, many write as if the Biblical case against universalism is overwhelming. But this confidence is badly misplaced. As we’ll see in sections 5, 6 and 8, below, it’s mainly due to a confusion of universalism itself with certain unbiblical versions of universalism. Many of the passages that are typically utilized to attack universalism teach exclusivism — which here refers to the doctrine that it’s only (exclusively) through the saving work of Christ that any can be saved. I agree that exclusivism is clearly taught in the New Testament, so I won’t bother to cite the supporting passages. But the universalist needn’t deny exclusivism. The biblical universalist will accept exclusivism; she’ll just disagree with the non-universalist about the scope of who will be saved by Christ’s saving work — the universalist exclusivist holding that, eventually at least, through Christ, all shall be made alive. And now that I’ve echoed I Corinthians 15:22, it’s worth noting how this verse, as well as the other passages discussed in section 2, highlights the compatibility of universalism with exclusivism, since this universalist passage insists that it is in Christ that all shall be made alive. But perhaps we should distinguish between two types of exclusivism. Let’s label as strong exclusivism the position that adds to exclusivism the further claim that, in order to be a recipient of the salvation Christ makes possible, one must in some way explicitly accept Christ and/or the salvation he offers. (Different versions of strong exclusivism with differ as to the exact nature of this requirement of explicit acceptance.) Weak exclusivism, then, will be the position that combines the exclusivist thesis that Christ’s saving work is necessary for the salvation of any person — so that were it not for Christ, none could be saved — with the position that one needn’t explicitly accept or acknowledge Christ in order to receive the salvation his saving work makes possible. The scriptural basis for exclusivism is overwhelming, I believe; the support for strong exclusivism is not nearly so conclusive. It’s not that there’s any strong basis for weak exclusivism. It’s rather that the scriptural basis for deciding between the two versions of exclusivism is not nearly so great as that supporting exclusivism itself. Still, the suggestions of strong exclusivism found in the New Testament are strong enough that, for complicated reasons I won’t here go into, though I’m far from certain about the matter, I tend to lean toward strong exclusivism. But only if death is the end of one’s chances to be saved by explicitly accepting Christ. And I haven’t seen anything close to a strong Biblical case for the position that death is the end of one’s chances for salvation. (We’ll look at the typical argument mounted for the doctrine of no further chances a few paragraphs below). Many, in fact, content themselves with arguing that the scriptures typically used to support the position that some will get further chances after death are far from conclusive. Now, the issue of how to understand these passages from I Peter is as difficult as it is controversial. I won’t get into it here, except to register my opinion that it isn’t wise to lean on these passages; they’re far too inconclusive to inspire any reasonable confidence in the doctrine of further chances after death. But the case typically mounted in favor of the opposing doctrine of no further chances after death is at least as inconclusive. The only passage cited in favor of this dubious doctrine of no further chances in the notorious NIV Study Bible note to I Peter 4:6 is Hebrews 9:27, which reads: “Just as man is destined to die once, and after that to face judgment,” with the sentence being completed in v. 28. But the universalist who believes in further chances needn’t deny that people die once. I’m such a universalist, and I don’t deny that, nor do I see any reason why I should have to. And, as I noted in section 1 and as we’ll see in section 8, the universalist, including the universalist who believes in further chances, needn’t deny that after that death one will face judgment. So there isn’t anything in Hebrews 9:27 that should even begin to produce any discomfort in the universalist who believes in further chances. So to hold that this passage establishes, not only that those suffering from punishment can’t just end it any time they want, but that it can never, not even by the saving power of Christ, happen that they’re released from this punishment, is surely a very desperate stretch. In fact, I think no other doctrine can even compete with “no further chances” in terms of the following three factors. No doctrine even comes close to a) being so strongly believed by so many evangelicals despite b) being so utterly disastrous in its consequences and c) having so little by way of Scriptural support. Still, as I admitted earlier, the case for the opposing doctrine of further chances, based on the I Peter passages, is also inconclusive. But I never intended to use the I Peter passages as part of my positive support for universalism. My universalism is founded on passages like the ones we looked at in section 2. I find them far more forceful in their support for universalism than anything I’ve ever seen adduced in support of anti-universalism. But some will disagree, and claim that a powerful case for anti-universalism can be mounted from strong exclusivism, together with the very plausible observation that some never accept Christ in this life. I have merely been pointing out that that line of thought supports anti-universalism only insofar as the doctrine of no further chances can be established. And, as we’ve seen, that’s not very far at all. Certainly nothing even approaching the power of the universalist passages. If, on top of all that, there actually were — against my own best judgment about the matter — some significant positive support for the doctrine of further chances to be gleaned from the I Peter passages, that would be argumentative over-kill. Do I, then, believe in further chances after death? Yes, but not because of anything to be found in I Peter. My belief in further chances is rather grounded in my beliefs that (a) there are fairly strong grounds for universalism provided by the likes of the passages in section 2, (b) there are fairly strong grounds for strong exclusivism in passages we haven’t looked at here, (c) the only way (at least the only way that I can see) to reconcile universalism with strong exclusivism is if there are further chances, and (d) there’s next to nothing in the way of good reasons for denying that there are further chances. Thus, though there’s perhaps not much of a direct case that can be made for further chances from the likes of the I Peter passages, in light of (d), the indirect case for further chances provided by (a)-(c) proves decisive. I stress, then, that my belief in universalism is not based on my belief in further chances; rather, it’s the other way around. This raises the question: Who will so confess and so believe? This is one of those questions, at least with respect to the confession part, that gets answered in the Bible, for, as we read in Philippians 2:11 and elsewhere, every tongue shall confess that Jesus is Lord. Maybe some of these confessors will fail to believe in their heart that God raised Jesus from the dead, and thereby fail to be saved. But I always imagined this confession taking place at a time when it had become painfully obvious that the whole Jesus story was true — perhaps at judgment — so I’ve never really thought that these confessors weren’t believing. Yikes! I had always been taught, and had always thought I believed, that salvation came through God’s grace alone, and not at all through the merit of the one being saved. One just had to accept this grace, by confessing, etc. But the above line of thought shows that the tendency to understand rewards in term of merit was so strong in me that I had taken the confession and acceptance part of the above story and turned them into matters of merit — to the point that I wouldn’t let them count if they didn’t strike me as sufficiently meritorious. This is surely a dangerous line of thought. Three reactions: First, we don’t know enough about the circumstances under which such confessions will take place to judge their merit. But, second, should that matter? And, third, just how wonderfully meritorious was my confession and acceptance? Many of the passages that are typically utilized in attacks on universalism teach that, after death, God will judge people and punish many of them. Indeed, many who write as if the case against universalism is overwhelming list scores of such passages — which looks very impressive — in their long lists of what they claim are anti-universalist scriptures. Many of the passages typically cited in this connection are the endings of parables in which the unprepared or otherwise naughty are cast off to weep and wail and gnash their teeth. (It’s usually in Matthew’s presentation of parables that such an ending is included.) To get eternal punishment from such a parable is quite a leap. Some read many of these passages as Jesus predicting the suffering incurred during the destruction of Jerusalem. It was apparently a big issue in the Jewish community around the time of the writing of the book of Matthew whether this truly horrible and gruesome event was due to the Christians following a false Messiah (as some non-Christians claimed) or rather because the non-Christian Jews had failed to recognize the hour of their visitation (as some Christians held). Parables in which those not prepared for the coming of the Christ-figure are thrown out to weep and wail, etc., can easily be read as coming down on the Christian side of this debate. But even if one dismisses such an interpretation (though it’s difficult to see the grounds for such a dismissal), one should begin to appreciate the tenuousness of drawing a particular theological conclusion from such a parable. But the above is a secondary point, especially since many of the passages which teach that there will be punishment are not from parables. The main point to be made is that, as I pointed out already in section 1, universalism as I understand it — and, more importantly, as it’s supported by the universalist passages like those in section 2 — is perfectly consistent with the belief that there will be judgment for all and punishment for some. So, unless the universalist goes overboard and claims that there will be no punishment at all — an extension of universalism not licensed by the passages of section 2 — these passages teaching that there will be punishment won’t even begin to hurt her position. So, like the anti-universalist argument from exclusivism and the argument from strong exclusivism, this anti-universalist argument, now from punishment, has no force against the universalism that’s supported by the universalist passages, but only against the unwarranted extensions of universalism that some unwise universalists might make. Fortunately, this is only an apparent collision. The appearance of a collision is produced by a problem arising with our English Bibles’ translation of “eternal”. The Greek adjective (and its cognates) that our English Bibles translate as “eternal” or “everlasting” (and their cognates), literally means “age-enduring” or “pertaining to an age”, and can be used in such a way that it does not imply endless duration. This opens up a way around our collision: If the “eternal” in the “eternal” punishment passages is understood as not implying an endless duration, there’s no conflict between these passages and the universalist passages. What makes this a very comfortable, and not a strained or desperate, way around the collision is that, not only can the Greek word mean something that doesn’t imply endless duration, but it often does get used with such a meaning — including in the Bible itself, and even in the Pauline corpus. Consider Romans 16:25-26, which, as our translations have it, speaks of “the mystery that was kept secret for long ages but is now disclosed.” Here, the Greek that gets translated as “for long ages” includes the very Greek work that is translated as “eternal” or “everlasting” elsewhere, including the “eternal” punishment passages. But in this Romans passage, Paul seems not to mean “eternal” by this word, for he immediately goes on to say the secret “is now disclosed”, so of course it wasn’t kept secret eternally. That’s why our translations don’t translate it as “eternally” here. That Paul himself uses the relevant Greek term in such a way that it doesn’t imply endless duration makes the possibility that he’s using it the same way in the “eternal punishment” passages a very live possibility. By comparison, all the attempts to get around the universalist implications of the likes of the passages we saw in section 2 that I’ve encountered seem very strained, even desperate. (Example: “Here where it says that God through Christ will reconcile all things to himself, it really means (not what is says but rather? ), at least as it’s applied to people, that God, through Christ, will give all an opportunity to be reconciled to him, and where it says that in Christ all shall be made alive, what it really means (is not what it says but rather?) that in Christ all will be given an opportunity to be made alive, or that all will be made alive to the possibility of salvation.”) At the very least, those who think it’s clear that the strongest scriptural case on the question of universalism goes against the view, and that it’s therefore clear that it’s the apparently universalist passages which must be interpreted away, have a lot of explaining to do. Universalism is far from a mere doctrine of barren theology; many, like Paul, find great joy in the belief. Part of the joy some find is in the thought that not only they, but their fellow humans, will, eventually at least, experience everlasting life with Christ. But, like Paul, you may find the joy is focused rather on God, and on how wondrous and complete a victory will be won by the God “who desires everyone to be saved” (I Timothy 2:4). And, on the other side, the non-universalist picture may come to look strangely dim, not exclusively because of the awful fate that awaits some of your fellows on this picture, but because God is deprived of such a complete victory, and, in winning only a partial victory, his desire that everyone be saved will ultimately be frustrated. I scanned this drawing, by E.W. Kemble, from the 1885 edition (New York: Charles L. Webster and Company) of the Adventures of Huckleberry Finn, p. 366. 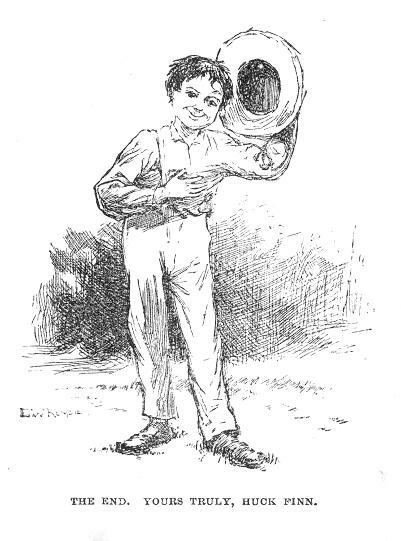 To see the other drawings by Kemble from the first edition, see Virginia H. Cope’s Huckleberry Finn site at the University of Virginia. All of the above remains basically unchanged in content since I wrote it for an adult Bible study in early 1998. (The only changes, I believe, are a couple of references and links to other web sites that I added to section 10 later and a reference added and marked as an update at the end of section 2.) Since I posted the above on the internet in the Winter of 98-99, I have received a lot of feedback on it. Some of the e-mail I have received has raised substantive points. Below I briefly address two of the areas that I have been very frequently asked about. The first area concerns the danger of believing and promoting universalism, and the second concerns philosophical issues that arise in reconciling universalism with free will. So in neither case do the concerns very directly involve the Biblical case for or against universalism. Thus, addressing them moves us beyond the topic of my original post. Nevertheless, since these are two of the areas of concern that have been most often raised about the above, it is worth addressing them here. I do not think that belief in universalism should have the above effects. Here it is important to note that universalism — at least the position I’ve been referring to by the term — does not imply that it is unimportant whether one accepts Christ in this life, or sooner rather than later. All that universalism per se rules out here is the “infinitely big stick”: that one will be eternally barred from heaven (and perhaps consigned to hell) if one fails to accept Christ in this life. As I’ve stressed, universalism itself does not rule out that there will be punishment for some after death. Indeed, it does not rule out that there will be a lot of punishment for some. So it’s not only consistent with the existence of sticks, but with very big — indeed, immensely huge — sticks, though of course universalists will disagree amongst themselves about the nature and size of whatever sticks there are. Universalism does rule out the infinitely big stick. But it would indeed be very sad if Christians believed that there is strong reason or motivation for accepting Christ in this life only if one faces an infinitely big stick if one fails to do so. Universalism also guarantees that all humans will eventually attain the tremendous carrot. But does the fact that things will eventually be OK for someone remove the motivation — for herself and for others — to improve her lot in the meantime? Those who believe they are going to heaven, whether they’re universalists or not, believe everything will eventually be OK for them, but few lose all interest in their well-being in the meantime. And those who believe that certain other people (say, loved ones) are destined for heaven don’t lose interest in promoting their well-being in the meantime. Why, then, should accepting that everyone will eventually be OK sap all motivation for promoting their well-being in the meantime — especially since it’s at least consistent with universalism that that “meantime” can be a very long time? It’s also worth pointing out that though the universalist believes all will attain heaven, it’s consistent with universalism that what one’s heavenly existence is like may depend on one’s earthly life. Thus the universalist may hold (though perhaps some will not) that how one lives one’s earthly life — perhaps crucially including whether one accepts Christ in this life — will have eternal significance, even if it doesn’t determine whether one (eventually at least) attains heaven. But even if I’m right that belief in universalism should not have the bad effects described above, I don’t doubt that belief in universalism will have such bad effects, at least on some. After all, some people claim that belief in universalism would have such a bad effect on themselves, and I’d be a fool to suppose I can judge better than them what the effect of the belief would be on them. But they are wrong. There are dangers on the other side. I have received many e-mails from those who have related that the doctrine of eternal hell was the biggest stumbling block to their accepting Christianity, and many others said that believing that doctrine interfered greatly with their ability to love God. Now, one doesn’t have to accept universalism to avoid the doctrine of eternal hell — one can accept some view on which those who don’t make it to heaven are (eventually or right away) annihilated. But, for many, universalism is the view that rings most true, and the version of Christianity they’d be most likely to accept. There is danger on both sides. Either way, if one is wrong, one may be doing harm to people by advocating one’s false view. Indeed, either way, even if one is right, one can do some harm to others by advocating the truth one believes. (Even if universalism is true, my promoting that truth may cause some to lose their faith, and may thereby harm them. Likewise, if universalism is false, those who declare it false may thereby harm some people.) One possible response to these dangers, whichever side one is on, would be to remain silent on the issue. [But there is also grave danger in remaining silent if you could have spoken up, since your speaking up might have helped someone!8/6/2010] Another response is to present one’s thinking on the issue for others’ consideration. That is the path I have chosen — as have those who write to oppose me. If I have caused you think about the issue, to study the Bible (especially important here is reading not just the passages for and against universalism that have been presented, but also the material that surrounds them and gives them their context), and to prayerfully consider the issue, then I am happy, even if I haven’t convinced you of my position. Many who have e-mailed me have been concerned about free will. Doesn’t one have to freely accept Christ in order to be saved? This is an extension of strong exclusivism. Strong exclusivism, as I have used it above, says that in order to be saved, one must somehow explicitly accept Christ. Now, we’re adding to this that the accepting must be free. Let’s call this new position fervent exclusivism. If we accept fervent exclusivism, how can we say that universalism is true? I don’t know of any serious scriptural support for fervent exclusivism itself. Still, it’s worth taking seriously and thinking about, because it is, for those who think human freedom is very important, the natural extension of strong exclusivism, for which there is in my view significant scriptural support. If you think that one must accept Christ to be saved, and if you think that human freedom is important, you’re likely to think that the free acceptance of Christ is very valuable and important — perhaps important enough that one’s ultimate destiny might ride on it. So, for those who are attracted to this fervent variety of exclusivism: First note that even fervent exclusivism is compatible with universalism. The first of these says that to be saved one must freely accept Christ. The second says that, eventually at least, all will be saved. It’s easy to see how these can both be true: If all will eventually freely accept Christ. But even if it is possible for both positions to be true, is it all plausible to suppose they will be? Supposing there is nothing barring further chances — that the free accepting may take place after death (see sections 6 and 7 above) — I don’t see why not. After all, there is an omnipotent and infinitely resourceful God, whom we know “desires everyone to be saved” (I Timothy 2:4), and has as much time as He needs to bring everyone around. I certainly wouldn’t want to bet against Him! We know that some in this life have been only been moving further and further away from accepting Christ. And some people can be very obstinate. And some have become incredibly evil in this life. But, on the other hand, even in this short life, we all know of instances in which people having all three of these problems to a great degree who were brought around and were saved. So, again, I see no grounds for pessimism that an infinitely resourceful God, who is able to take as much time as He needs, will be able to win over everyone eventually. But some seem to have a different worry — not that fervent exclusivism is incompatible with universalism, but that, if fervent exclusivism is true, then nobody, not even God, can know (or at least know for certain) that all will be saved, since nobody can know what people will freely do. So, even if universalism will turn to be true, we cannot know that now, and God would not have revealed that to us already. According to this worry, fervent exclusivism doesn’t show that universalism won’t be true, but it does undermine the position that universalism is revealed in the scriptures. This new worry, then, is based on the assumption that free will is incompatible with foreknowledge: that it is impossible, even for God, to know (or at least to know for certain) ahead of time what someone will freely do. Note that God can still be omniscient despite not knowing what we will freely do. Omniscience is a matter of knowing all truths. And if you deny that God knows what creatures will freely do, you’re likely to also believe that there aren’t now any truths to be known about what creatures will freely do in the future. God’s “failure” to know what you will freely do then would count against his omniscience no more than does his “failure” to know that 2+2 = 796: In neither case is the proposition in question (now) true and so in neither case is it the kind of proposition that can (now) be known. But while the assumption that freedom is incompatible with foreknowledge doesn’t undermine God’s omniscience, it is highly debatable. In fact, my sense is that most theists reject this assumption. Indeed, traditionally, many theists have supposed that free action is not only compatible with foreknowledge, but also with divine determinism: That one can be free even if God’s decrees causally determine you do the action in question. How can one be free if divine decrees, issued long before one is born, causally determine what one does? I don’t know. That position — compatibilism about freedom and determinism — has always seemed very implausible to me. But even among those who join me in rejecting compatibilism about freedom and determinism, many (and I think most) accept the compatibility of freedom and foreknowledge. If, on the other hand, you hold that foreknowledge is incompatible with freedom, and thus hold that God does not know what people will freely do even in this life, then you should be aware that you are holding a minority opinion (at least among Christians, but I think also among philosophers, both Christian or non-Christian), and if you use this incompatibilism — let’s call incompatibilism regarding freedom and foreknowledge zealous incompatibilism, to distinguish it from the milder view that freedom is incompatible with pre-determination –, together with fervent exclusivism, in objecting to the universalist stance, then you should be aware that your argument is resting on an assumption that is highly debatable, to put it rather mildly. So it certainly isn’t anything of a “killer” objection to the universalist stance. As far as assessing the strength of the objection to universalism that can be obtained by these worries about freedom goes, that’s the important point: There is no strong objection here, since the objection is based on such a controversial position — indeed, on two highly debatable positions: fervent exclusivism and zealous incompatibilism. Option 1: Holding very firmly to both zealous incompatibilism (freedom is incompatible with foreknowledge) and fervent exclusivism (in order to be saved, one must freely accept Christ), one can hold that, while it may not be absolutely certain, it is OVERWHELMINGLY probable that all will eventually accept Christ and be saved, and the probability that any will resist forever is VANISHINGLY small. After all, God will be on the case, and will have as much time as He needs. While it is true that some are heading in the completely wrong direction, and give no sign that, left to their own devices, they will do anything but accelerate their progress in that wrong direction, they will not be left to their own devices. There are actual instances in this life of breathtakingly dramatic turn-arounds, and God does intervene to bring people around in this life (without violating their freedom, according to the fervent exclusivist). So once we jettison that disastrous and quite unsupported view that death is the end of one’s chances, there’s no reason to doubt that such divine activities will continue in the life to come, nor that they will (eventually, at least) be successful in yielding free acceptance. If one takes this option, I think one can still be counted as a universalist. After all, you believe it is overwhelmingly probable that all will be saved, and in contested theological matters, we can’t expect to reach beyond that level of certainty anyway. (Indeed, due to the usual causes — human fallibility on such tough questions — we’re not even going to get up to that level of certainty, nor even close to it, on this or any other tough matter, anyway.) But this does seem to compromise on universalism a bit, because one is not only admitting that one could (of course!) be wrong about the matter in question, but also that according to the position one holds (however firmly or tentatively), there is some (VANISHINGLY small, but still existent) objective chance that not all will be saved. Not even God knows absolutely for certain that all will be saved. And this gives rise to a sticky question about whether God would have revealed that all will be saved if He was not absolutely certain that this would be so. It’s easy to feel uncomfortable about saying that’s what God did — even if He was amazingly close to being absolutely certain that what we was revealing to us is true. Now, this position does give up on fervent exclusivism (though not on strong exclusivism or exclusivism simpliciter), since it holds that one can be saved even if one does not freely accept Christ. Nevertheless, it does go a fair way toward accommodating the motivation behind fervent exclusivism — the importance of human freedom — in that it has God adopting a plan by which He goes to tremendous lengths to attain free acceptance from every person. And those who hold this view can still maintain that it is far better and more valuable for a person to freely accept than for this acceptance to be coerced in a freedom-negating way. But it does deny that one must freely accept in order to be saved, and thus it does deny fervent exclusivism. Still, it’s worth considering, for it gives those who might otherwise insist on fervent exclusivism a compromise position which doesn’t simply write free acceptance off as unimportant. This potential compromise position is especially valuable if I’m right about how one would likely come to be a fervent exclusivist in the first place: That there’s no substantial scriptural support for fervent exclusivism itself, but that fervent exclusivism is the likely result of combining strong exclusivism (for which there is significant support) with a belief one might have that human freedom is important. Since the compromise position respects the importance of human freedom, it is likely to be an attractive compromise. The above options are sketched out as potentially helpful guides for those who are attracted to certain combinations of views involving freedom, foreknowledge, and salvation. It’s important to reemphasize in closing the important point reached several paragraphs above: that there is no strong objection to universalism that can be squeezed out of these thoughts — at least not in any way that I can see. The Inescapable Love of God, by Thomas Talbott. An excellent defense of universalism by the philosopher, Thomas Talbott. Universal Salvation? : The Current Debate, edited by Robin A. Perry & Christopher H. Partridge. Part I is a defense of universalism by Thomas Talbott; Parts II-V are “Biblical Responses,” “Philosophical Responses,” “Theological Responses,” and “Historical Responses” to Talbott from a variety of evangelical writers; and Part VI is Talbott’s Replies to these Responses. The Evangelical Universalist by Gregory MacDonald (pseudonym). I still haven’t read all of this book myself, but what I have read of it is very promising, and it comes highly recommended by some folks who really know what they’re talking about. If Grace Is True: Why God Will Save Every Person, by Philip Gulley and James Mulholland. Though I found this book quite valuable, I do disagree strongly with parts of it. Most of my strong disagreement is with the material in Chapter 5. Most relevant to the concerns of this web page, Gulley & Mulholland seem to reject the position I’ve been calling “exclusivism” — the view that it is only through Christ that people are saved. They seem to think that the denial of exclusivism follows directly from universalism [see pp. 124-5] and in any case give no other reason I can see for their denial. As I’ve been at great pains to stress here, universalism can co-exist with what I’m here calling exclusivism, and even with strong exclusivism — and perhaps even with fervent exclusivism. Perhaps G&M would agree that universalism is compatible with exclusivism. Perhaps their claim would be that while universalism is compatible both with exclusivism and with non-exclusivism, it fits in better with non-exclusivism. They write [they adopted the literary device of writing in the first person singular, though there are two of them]: “When I became convinced God would save every person, I tried to hold on to traditional Christian formulas — the trinity, the incarnation, and atonement theology. I wanted to pour this new wine into old wineskins. I quickly learned why Jesus recommended against this: the old wineskins always burst. Just as fermenting wine causes old leather to rend and tear, my expanding view of God strained the credibility of my childhood theology” (pp. 125-6). Perhaps exclusivism, too, is part of that old wineskin that G&M now find not to fit in well with the new wine of universalism — maybe they even intended to include exclusivism in the quoted passage, as part of the “atonement theology” of their childhood. If so, my experience has been completely different. The Christian theology I grew up with seems quite similar to what G&M were taught. But I had always found it puzzling, given the relevant elements of this theology, why some would not be saved. If salvation is won through Christ’s sacrifice, and is then God’s free gift to us, why would this gift be given only to some? Of course, there were answers that were typically given to this question, but with one exception they struck me as implausible. (The one reason that seemed plausible was that only some accept the gift, but that raised the question, at least in many cases, some of which made the question quite urgent, of why the offer wouldn’t be made under more favorable circumstances.) When I accepted universalim, I found it to fit in better with the other relevant elements of the theology of my childhood than did the denial of universalism. So far from being new wine that strained and burst an old wineskin, universalism seemed to me like something that made a lot of previously puzzling elements of my childhood theology finally come together and make sense. Love Wins: A Book About Heaven, Hell, and the Fate of Every Person Who Ever Lived, by Rob Bell.12/23/2011There was a lot of controversy about whether this book espouses universalism, with Bell himself, in interviews given around the time of the release of the book, denying that it does. Though Bell’s denials seemed to me to be based on an overly stringent account of what it takes for a position to count as universalist, in the end, I accept his denial (even if not the reasons he gives for it). Still, this book provides a nice and sympathetic exposition of the universalist position. (The view was presented not as Bell’s own, but as a view to be discussed. That he presented it so nicely and compellingly is part of what got him ID’d as a universalist, I think.) This is a very accessible book that will appeal to many Christians who are chafing under traditional doctrines of hell, and who are hungry for alternative visions. I suspect it has been and will be literally a Godsend for many readers. I recommend Tom Talbott’s short but nice review of the book here. I have discussed some issues surrounding Christian universalism (not the scriptural case for & against the view, though that does come up in some of the comments to the posts), in these posts to the “Generous Orthodoxy Think Tank” group weblog. I have also posted at “Generous Orthodoxy Think Tank” a paper sent to me by Gregory MacDonald (ppseudonym), author of The Evangelical Universalist (see above, under “Books”).